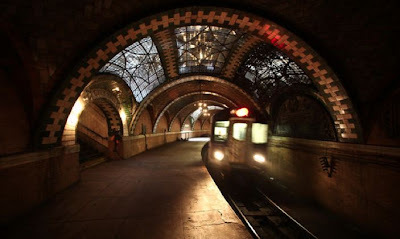 Maximizing Progress: Guastavino Vaulting ~ Lovely Curves of the City! "Guastavino domes and vaults are everywhere, but they are not always easy to see. Some of the best work by Guastavino and his son, Rafael Guastavino y Esposito, like the stairwell of Washington Memorial Arch or the passenger platform of the abandoned City Hall subway station, is out of the public eye." Check out the slideshow... Be sure to also see MIT professor John Ochsendorf's Guastavino Project and book Guastavino Vaulting: The Art of Structural Tile for more on these beautiful Palaces for the People!